Maybe you’ve already been, maybe you’ve been admiring from afar, either way, we think it’s fair to say Franc’s Deli & Wine has been humbly flying under the radar since opening this past winter. If there’s ever a good sign, this tucked away posi in Broadbeach has a fiercely loyal following from an in-the-know hospitality crowd. You know, the guys and gals that keep us watered and fed up and down the Coast choose to head HERE on the rare occasion they get a night off. That says a lot in our books, so we were sufficiently tempted to check it out for ourselves. Franc’s Deli & Wine is the project of talented young local, Harry Pearce. On completing his cheffing apprenticeship, Harry finessed his skills working in restaurants across Melbourne. During that time his dear mum and dad, Thea and Brad, ran the wildly successful Espana tapas bar. With the Broadbeach dynamic shifting and with tapas-style dining becoming the norm across Gold Coast menus, they decided it was time for a change. Harry returned home and teamed up with his parents to jointly launch Franc’s Bistro, and his own baby next door, Franc’s Deli & Wine. Harry tells us Parisian-style bistros are smokin’ hot property in Melbourne and Sydney in recent years, hence his motivation to fill a gaping hole in the market here. Currently the Gold Coast is swept up in an Asian fusion tsunami, while still basking in a flood of American grub. So we guess you could say Franc’s Deli & Wine has landed before its time. Though with Harry at the helm, one of the Coast’s rising star chefs who’s pushing the boundaries, we think it’s all the more reason to make a date. Here intimate seating is designated to high stools along the bar and woven Parisian bistro chairs, with round marble-esque topped tables graciously lining the sidewalk. It’s a hole-in-the-wall (albeit a gaping wide one) and we’re going out on a limb to say there’s nothing else quite like it on the Coast. 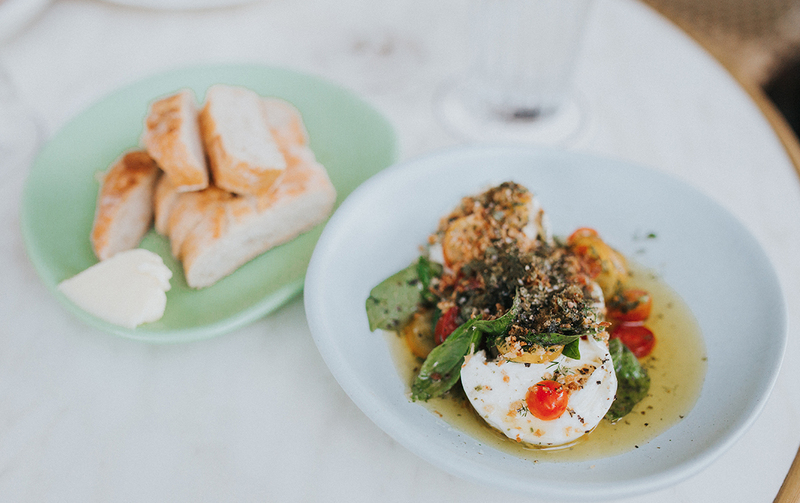 While Franc’s Bistro is set up for full-on feast sessions, next door Franc’s Deli & Wine totally lends itself to post-work drinkies, or small plates and vinos with the gals prior to a night out in Broadbeach. It oozes a friendly vibe where you might find yourself bantering with adjacent tables or choosing the evening’s soundtrack with a constant rotation of vinyls on the prized record player. Franc’s Wine & Deli’s intriguing, small-batch natural wine list is another cool point of difference. Perhaps we’ve been ruined by too many NZ sav blancs and mass-produced merlots over the years, so an evening loitering at the bar was both fun and educational. Natural or “low-interference” wines are picked and processed by hand, without any addition of chemicals, which means they’re often cloudy, sometimes inconsistent, and tasting perhaps not as you’d anticipate from a particular grape. Complimenting the rare all-natural wine list, Franc’s Bistro next door has an exclusively French-imported collection that will impress the most discerning vino drinker. Yep, it’s all in the details here, even the cultured butter and par-baked bread is sourced from France. On Harry’s recommendation, we started out with tender grilled prawns soaked through with garlic butter. And a dish that was constructed before our eyes, we scooped up every last morsel from a plate of heirloom tomatoes on a generous bed of creamy buffalo mozzarella, topped with fragrant basil, toasted bread crumbs, burnt Kombu, and drizzled with top-quality olive oil for dipping that bread. We’re going to be bold and say it was one of the best Gold Coast dishes ever to pass out lips. Srsly. Adding to the authenticity, much of the charcuterie is made in-house. From house-made terrine and fermented chilli, to a glass display cabinet filled with sauerkraut, onions, kimchi, and salt bush—mid pickle. During our visit we were schooled on the meticulous process of making chicken liver paté (which was buttery and super tasty, in case you’ve got your nose screwed up). Harry’s mum, the beautiful Thea, is a master dessert maker too, serving us up one of her epic freshly-baked lemon tarts to finish. Drool. Produce used here is hand-picked from Burleigh Farmers Market or Mermaid Beach’s Fruit Market and herbs regularly foraged for in Tallebudgera Valley. It’s small scale, slow food that’s truly a labour of love and totes deserving of a solid two thumbs up! Aside from their normal evening offerings, they make a wicked loaded baguette that’s a top-value lunch, and have already hosted a handful of intimate, sold-out degustation dinners, collaborating with winemakers or other insanely gifted chefs from Bstow and The Fish House to name a few. If you haven’t already picked up what we’re laying down, we’re pretty taken with Franc’s Wine & Deli and of course, sleek Franc’s Bistro next door. And after an evening hanging out with Harry; sampling natural wines, nibbling on cheese, paté, and delicate nek-level dishes, we’re super envious of anyone who works within walking distance and can call this their Friday knock-off local. For the rest of us, gather your besties or lover and make a date with Franc’s Deli & Bistro this weekend (and in turn, the talented Harry). ‘Cause there will never be such a thing as too much wine, cheese, and charcuterie.